The People's Republic of Bangladesh (formerly East Pakistan) is located on the Bay of Bengal bordered by India and Burma. After independence in 1971 the new state endured famines, natural disasters and widespread poverty, as well as political turmoil and military coups. The restoration of democracy in 1991 has been followed by relative stability and economic progress.The economy is predominantly agricultural with Jute and Tea being the main exports. Europeans began to set up trading posts in the area of Bangladesh in the 16th century; eventually the British came to dominate the region and it became part of British India. In 1947, West Pakistan and East Bengal (both primarily Muslim) separated from India (largely Hindu) and jointly became the new country of Pakistan. East Bengal became East Pakistan in 1955, but the awkward arrangement of a two-part country with its territorial units separated by 1,600 km left the Bengalis marginalized and dissatisfied. East Pakistan seceded from its union with West Pakistan in 1971 and was renamed Bangladesh. A military-backed, emergency caretaker regime suspended parliamentary elections planned for January 2007 in an effort to reform the political system and root out corruption. In contrast to the strikes and violent street rallies that had marked Bangladeshi politics in previous years, the parliamentary elections finally held in late December 2008 were mostly peaceful. Sheikh HASINA Wajed was reappointed prime minister. About a third of this extremely poor country floods annually during the monsoon rainy season, hampering economic development. 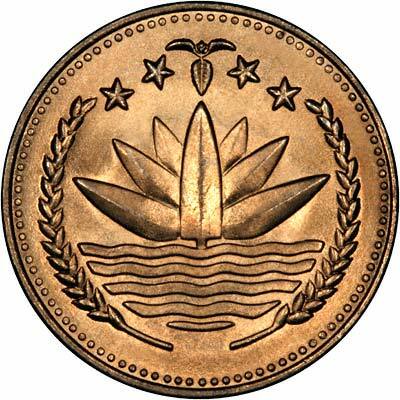 For silver and base metal coins of Bangladesh, please look at our original Chard Coins website. 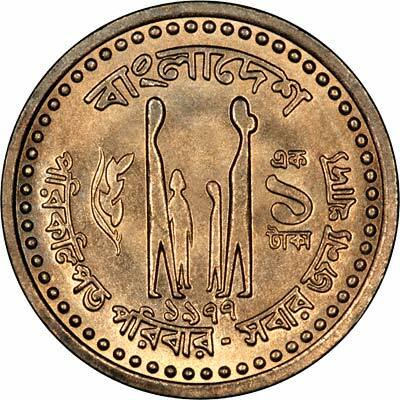 We make an active market in almost all world coins, gold or otherwise, including Bangladeshi gold coins. If you have any of these coins to sell, please contact us, or post them to us for appraisal and offer.